Tada! Wonder what this triple hybrid of an animal is? hehee... read on. I had a doggie figurine which broke due to an unfortunate accident. I bought a new one to replace it coz I really love this figurine of a Great Dane with glasses and a scarf, pretending to be an old lady. I fixed the broken leg and ear. For the snout, I stuffed the gaping hole with cotton wool. And muzzled it with several layers of newspaper using the papier mache method. I broke the pair of wired glasses and glued semi wet tissue onto the forehead so that there is no gap between the head and the scarf. When the reconstruction of the head was done, I added a long horn. I wanted it way longer than that of a regular unicorn for a comic effect. Next, I restructured the face by elongating the snout and adding some eye sockets and nostrils using rolled up tissue. I prefer tissue for these details rather than newspapers as it is easier to handle and gives a softer finish. Yups, this hybrid is ready after a day of drying. I used Reeves Gesso to prime the body coz its initial body was rather smooth and I wanted the papier mache to have a slightly textured surface to stick on. I made use of lots of origami paper from Daiso and layered them over the figurine. Once I was done, I applied a layer of Mod Podge over the surface to seal as well as to give it a shiny finish. Here's a close up after the Mod Podge has dried. 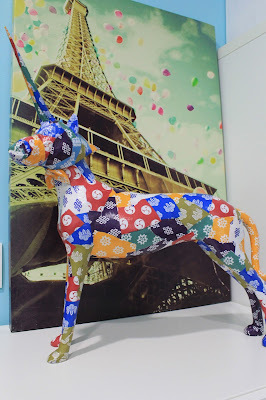 I've put together some tips on papier mache... click here to read. Till then, Talk to you ladies soon!